The Democratic Republic of São Tomé and Príncipe is the second smallest African country, formed by two islands: São Tomé and Príncipe. They are about 140 km apart and about 250 and 225 km, respectively, off of the northwestern coast of Gabon. The islands were a Portuguese colony, but have been independent since July,1975. Portuguese is the official language. The Porguese arrived in São Tomé Island on December 21, 1471 and Príncipe Island on January 17, 1492. As these were days dedicated to saints, both islands had saints’ names but S. Antão Island, the former name of Príncipe Island, changed in 1500 in honour of a Portuguese prince. The official historical version says that the country was uninhabited before the arrival of the Portuguese sailors. The first successful Portuguese settlement in the archipelago was established in 1493 when the volcanic soil of the islands proved to be good for sugar plantation - the first economic cycle. But between the 17th and the 18th centuries, the islands suffered an economic and social decline as a consequence of a slaves’ revolt headed by King Amador. In the 19th century the archipelago regained importance to Portuguese settlers when they decided to introduce coffee and cacao plantations. On February 3, 1953 the Massacre of Batepá occurred, when thousands of local people were killed by Portuguese settlers as a consequence of a disagreement between them about hired labour. Since slavery had been abolished, the Portuguese needed workers for their cacao and coffee plantations and the local people refused to work under the conditions offered, which, for them, were similar to slavery. The archipelago’s independence movement started with the constitution of the CLSTP (Committee for the Liberation of São Tomé and Principe), formed in the late 1950s, which changed its name to MLSTP (Movement for the Liberation of São Tomé and Príncipe), the first political party after the independence, on July 12, 1975. When São Tomé and Príncipe was declared independent and became the Democratic Republic of São Tomé and Príncipe, Manuel Pinto da Costa, the MLSTP`s General Secretary, was named the first archipelago president. From then on, the political system implemented was the single party regime which prevailed until the 1990s when there was a political and economic reform and the multiparty regime was implemented. In the first presidential election, Miguel Trovoada was elected as the second president of the islands. His successor, after two terms, was Fradique de Menezes, the current president who is in his second presidential term. The president, like the prime minister, is elected by direct universal suffrage for a five-year term and can be re-elected. The PM is elected for a four-year term, and the thirteen members of the cabinet (the group of ministers) are chosen by him. The cabinet constitutes the executive power and shares the legislative power with the National Assembly. The judiciary is independent from the other two. As a multiparty regime, the country’s main political parties are: the Movement for the Liberation of São Tomé and Príncipe (MLSTP), the Party of Democratic Convergence (PCD), the Independent Democratic Action (ADI), and the Democratic Movement Force for Change - Liberal Party(MDFM-PL). São Tomé and Príncipe is divided into 2 provinces: Príncipe, São Tomé. The provinces are further divided into seven districts, six on São Tomé and one on Príncipe (with Príncipe having self-government since April 29, 1995). São Tomé and Príncipe is formed by two volcanic islands - the biggest of which is S. Tomé - and several islets, and is in the Gulf of Guinea, off the Western equatorial coast of Africa. Both islands belong to the Cameroon volcanic mountain line. The archipelago is 1,001km2 in size. The equator line passes through the Rolas’s Islet which is in the South of S. Tomé Island. The biggest peak is in S. Tomé, known as Peak of S. Tomé with 2,024m. The climate is tropical, hot and humid, with an annual average temperature of 27 C. There are two main seasons: Gravana, the driest season when there is less or no rainfall and the temperatures are lower; and the rainy season, when the temperature is higher. The former goes from June to August, and the latter, from October to May. Since the archipelago´s discovery, its economy has been based on agriculture and fishing. Nowadays its main crop is cacao; it represents 95% of the country’s exports, and is followed by copper, palm oil and coffee. Another economic activity is tourism, which the government and the private sector have been trying to promote and develop in the last few years. After independence, the country’s economy was nationalized until the early 1990s when the government started an economic reform that consisted in privatization of the economic sectors. Nowadays, the government budget is mainly based on foreign assistance from donors such as the UN Development Programme, the World Bank, and country donors. The main importers of the archipelago's production are Portugal with 51%, France with 14%, Angola with 11%, and Japan with 10%. In 2001, petroleum was found in the waters claimed by the archipelago and Nigeria. After negotiations, the two countries reached an agreement and, in 2003, a joint development zone was opened for bids. But so far, there is no petroleum exploitation yet. According to the last census, about 163,000 people lived in São Tomé and Príncipe. 52,000 lived in the capital and less than seven thousand lived on Príncipe Island. São Tomé is the country’s capital and main city. The people of S. Tomé and Príncipe are divided into the following ethnic groups: mixed-blood, descendents of Portuguese settlers and African slaves; Forros, the biggest ethnic group and descendents of freed slaves; Angolares, descendents of Angolan slaves; Tonga, mixed blood of Forros and hired workers from Angola, Mozambique and Cape Verde; and Cape Verdean descendents. In the last few years, people in the country have been leaving to find better life conditions in the city S. Tomé. The country’s official language is Portuguese. 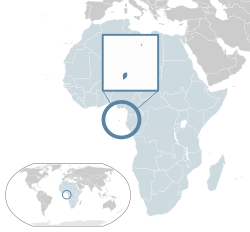 Other languages spoken are: Forro, a creole spoken by 80% of S. Tomé Island`s people; Angolar, spoken mainly on the Southeast of S. Tomé Island; Lung`ié, spoken in Príncipe Island; and Creole from Cape Verde. Almost everyone is Christian: Roman Catholic, Evangelical Protestant and Seventh-Days Adventist. But the Christian faith co-exists among the people with Animist practices. The country’s culture is the product of Portuguese and African cultural influence. Typical dances on the islands are: Ússua, Socopé, Dêxa, and Puita. Tchiloli, Danço Congo and Auto dos Floripes are public theatrical performances, examples of the Portuguese cultural legacy. Important names of the archipelago history and culture are King Amador and Alda Espírito Santos(1926-2010). The illiteracy rate in São Tomé and Príncipe is above 70%, although children start school at age six. Nowadays, the country has three private universities. ↑ 2.0 2.1 2.2 2.3 "São Tomé and Príncipe". International Monetary Fund. http://www.imf.org/external/pubs/ft/weo/2011/01/weodata/weorept.aspx?sy=2008&ey=2011&scsm=1&ssd=1&sort=country&ds=.&br=1&c=716&s=NGDPD%2CNGDPDPC%2CPPPGDP%2CPPPPC%2CLP&grp=0&a=&pr.x=43&pr.y=9. Retrieved 2011-06-11.